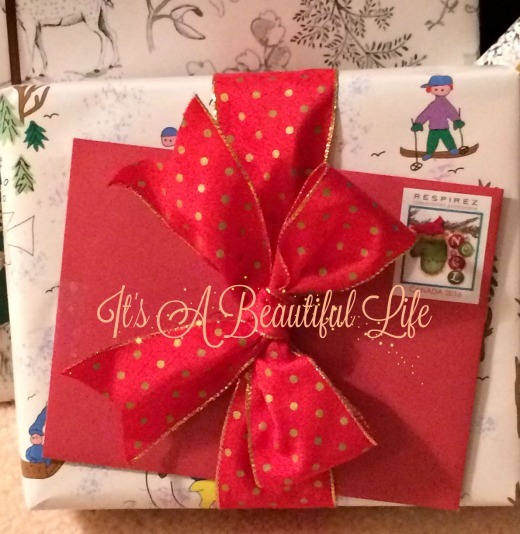 Brenda @ It's A Beautiful Life: THREE More Sleeps! So, Christmas Lovers, are you ready? It really is hard to believe there are only three more sleeps, but ready or not, here we are. When a person gets closer to the big day, especially if one is hosting the festivities and family gatherings, it is suddenly very easy to cross things off the list that were really only hopefuls anyway. At this late stage, only essentials need apply. But we're not hosting this year, so for me, it's been a gentle rhythm of getting into the Christmas spirit. A little baking, a little cleaning, some decorating when the whim inspires, a little shopping, a concert or two. Enjoying the rustle of tissue paper, not to mention the sampling of chocolates and baking. All with cheerful cups of tea and Christmas music in the air ... and, since there's no pressure, there's also time for being quiet with one's thoughts and for being in wonder all over again as we prepare for this beautiful and sacred time of year. Over the last couple of weeks my desk has become quite the happy mess of Christmas miscellany: pretty greetings cards and postage stamps, stashes of coloured ribbons, tissue paper, scissors, and pens. With the added string of cheery lights, it has become a favourite cozy nook as evening shadows lengthen. We've been writing out cards, making lists, dreaming up something nice for you to read here. Even composing a note with some hard-to-say things to someone dear. Yet I feel comforted as I sit here at my antique table in the warm glow. Beribboned packages are beginning to show up in various corners of the house. Oh, what fun! I love presents and I love surprises of a good kind. I used to be the kid under the tree rattling all the boxes to see if they shook. We have presents under the tree, but they seem to be gathering elsewhere as well. Surprise Santa parcels are arriving in the mailbox which we then add to the growing pile. There's more parcels inside that gorgeous box with the gold dots. I thought the elegant ceramic birds perched on top--both a gift from a dear friend earlier this month--lend a certain je ne sais quoi to this little vignette. Now, who can talk about Christmas baking without providing some eye candy and maybe a recipe to go with it. This Chocolate Marshmallow Roll was a favourite at Christmas when we were kids growing up. It was especially yummy, stolen and eaten straight from the freezer. With a texture that's soft and crunchy, sweet and chocolate-y -- what is there not to love? The other evening I happened to say to Rick, "I think I'm getting addicted to those marshmallow pieces. "No getting addicted, you already are," said he, with a grin. Haha ... indeed, she is already obsessed. Quite. I promised Facebook friends I'd share the recipe. So here it is. Quite simple. A tad messy, which just means you'll have to lick your fingers, not just the bowl, when it's all done. 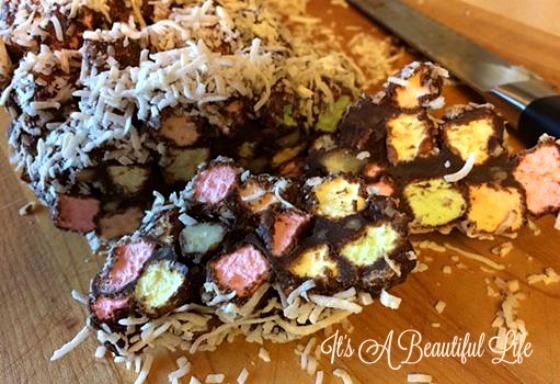 Fold in marshmallows and walnuts; mix till everything is coated. Sprinkle a generous sheet of wax paper with the coconut. Spoon out marshmallow mix onto coconut. Form into two logs using the wax paper to shape. Finish rolling the logs in coconut. before indulging slicing into 3/4 inch slices. As a way to close out this old year, as this may well be my last post for 2016, I decided to post one of our holiday photos taken this past summer. 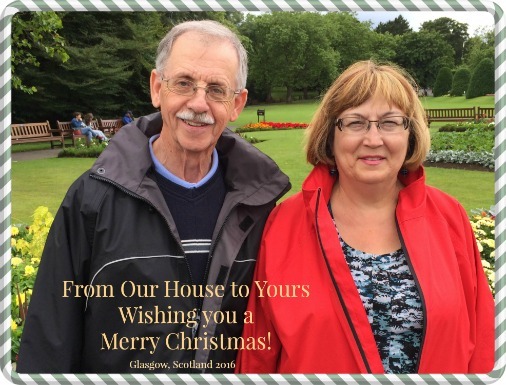 Rick and I are standing at the entry of the Glasgow Botanic Garden on a cloudy afternoon. 'Twas a wee bit rainy, which meant I finally had a chance to wear my new red raincoat; the weather had been so lovely we hardly needed it. Looking ahead to the new year, I still have photos I want to share of our holiday to England ... I never did show you pictures of our visit to Highclere Castle where Downton Abbey was filmed. We had a wonderful tour of the house and gardens, and it really did feel special walking down that grand staircase in the main hall, even though we were wearing our heavy duty walking shoes... no sign of dance slippers or elegant Lady Mary shoes that day. And so, dear beautiful friends, before I go I want to wish each of you a very special Christmas. May you catch glimpses of heaven in unexpected places. May you experience tidings of comfort and joy. And for those with light, merry hearts, may there be much laughter and celebration. Lovely pictures! I like the happy mess on your desk. We're counting only 1 more sleep, as youngest son arrives home tomorrow for the festive weekend! I'm checking all my lists, making sure nothing important has been left undone. Happy Christmas! Wishing you a lovely peaceful Christmas, dear Brenda. Your picture of the two of you is wonderful! Both of you look so happy. I enjoyed your count down to Christmas. Lovely photos. The picture of the two of you is wonderful. May you have a happy and healthy holiday season. 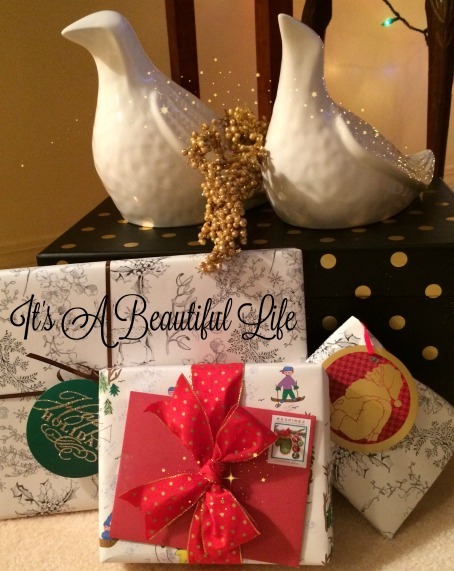 What lovely snapshots of your Yuletide season. Merry Christmas, Brenda! Lovely vignettes from your home, Brenda. May you have a very Merry Christmas, filled with Christ's light and love. And I, for one, will eagerly await more stories of your trip to England. I still have a few to share from our trip, too. Merry Christmas to you also, thanks for sharing a peek into your world. Well I think I'm going to end my visits here today Brenda. You have left me with beautiful images of Christmas in the best way. I still have some last minute things to do, but will think of you at your antique desk enjoying the splendor of it all. Merry Christmas to you and your dear husband. That's such a nice photo of the two of you! Enjoy your family gatherings, and God bless! That's such a great photo of the two of you and brings back fun memories too! Merry Christmas! I have enjoyed some of your photos on FB Bren and think your (very neat) desk looks lovely with the added sparkle. Christmas is more enjoyable and laid back when one is not hosting and it's a warm gathering when informal. What a lovely happy festive post! So glad to be able to visit with you & enjoy your post! 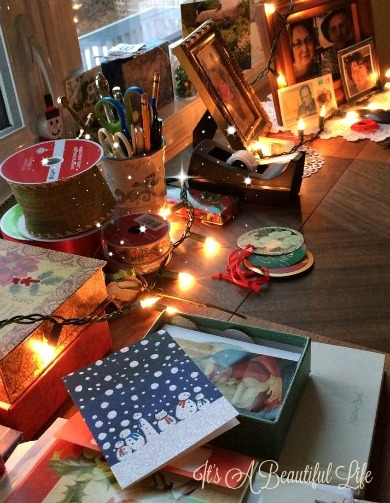 How festive and cozy your home looks, Brenda! Merry Christmas to you and Rick! Oh that marshmallow treat looks yummy! Happy Christmas and a great and prosperous new year. Oh that's right...you have much more to show us. I think posts on Highclere will be especially welcome when we don't have Downton Abbey to watch this winter. Your marshmallow treat looks colorful and tasty! I'd be addicted as well. Lovely picture of you and Rick. Always a pleasure to actually see our blogging friends. Merry Christmas Eve Eve! A lovely festive five! The marshmallow roll looks yummy and I'll be adding the recipe to my list, thank you. Merry Christmas and have a wonderful festive holiday. Ahhh ... now I'm ready for Christmas. Couldn't have done it without you, Brenda. Thank you so much for your lovely lovely post. That seems to be an easy going Christmas time. For me this year too. No family, but friends, but not a great supper either. Merry Christmas to you ! Your household seems ready to enjoy the holiday. Having done our Hanukkah celebration early,I feel a bit let down -- but also relieved that I'm done with the wrapping and cooking. That marshmallow log looks like kid's dream! Beautiful from beginning to end! I always appreciate your thoughtful, happy posts! Wishing you and yours a blessed Christmas season and New Year! A lovely post and thank you for the recipe. As Christmas has passed, do you think it would work with white chocolate for Easter? Wishing you a perfectly beautiful and exciting 2017. Oh how lovely... such precious wrapping paper in the photo at the top and that red bow! ... and what a lovely photo of you both at the end, too! I am looking forward to your posts of your travels in England. And, I can totally relate to the desk being a pile... time for me to get that back under control before the new year kicks off. Happiest Christmas and Blessings on the New Year!